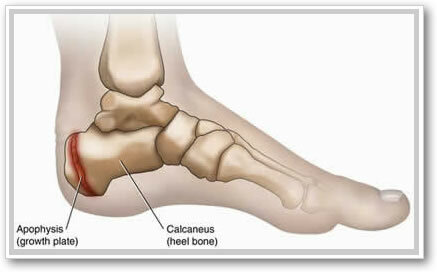 The area of most concern with childer with injuries to the heel bone is the growth plate in the calcaneus called the apophysis (below left). 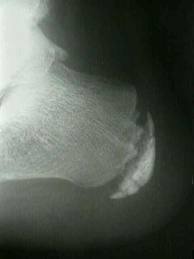 Injuries to this in children is very painful, causes limping especially after activity, and in severe cases can alter the growth of the bone. X-ray imaging (below right) can show changes in the growth plate in sever cases but should be compared to an x-ray of the un-injured foot to compare. 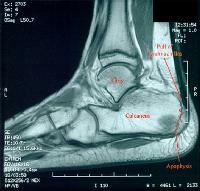 MRI imaging is best to demonstrate the injury.